The immunoregulatory protein T cell immunoglobulin- and mucin-domain-containing molecule-3 (Tim-3) contributes towards T cell exhaustion in several chronic diseases, including melanoma . NK cells from the latter were shown to be functionally impaired/exhausted, as they failed to proliferate, produce cytokines or kill target cells. In addition they down regulated activating receptors (NKG2D and NKp46) and upregulated inhibitory receptors (KIRB1, KIRNKAT2 and Tim-3). Notably Tim-3 blockade reversed this exhausted phenotype, implicating this molecule as a major checkpoint inhibitor in advanced melanoma . To further evaluate NK cell phenotype and function as a consequence of progressive melanoma, we monitored NK cells from a large cohort of patients with stage I-IV melanoma tested the association between NK cell phenotype and clinicopathological variables associated with melanoma prognosis. Expression of MICA (NKG2D ligand) and HMGB1 (Tim-3 ligand) in the plasma/sera of our main cohort was also monitored in an independent validation cohort. NK cells were purified from the peripheral blood of melanoma patients. They were evaluated for the expression of activating and inhibitory receptors. Cytotoxicity was measured by Lamp-1 expression. IFN-γ production was measured after 4h stimulation with rhIL-12. Proliferation was quantified by CFSE after 6 days in the presence of rhIL-2. MICA and HMGB1 expression on patients' plasma/sera was measured by ELISA. Event-time distributions were estimated with the use of the Kaplan-Meier method. Two tailed t-test unpaired was used to compare samples from different stages. NK cells gradually develop a phenotypic and functional profile consistent with progressive exhaustion, from stage I to stage IV characterized by: 1) up-regulation of inhibitory receptors (Tim-3, KIRB1 and KIRNKAT2); 2) down-regulation of activating receptors (NKG2D and NKp46); 3) loss of IFN-γ production, proliferation and cytotoxicity. Interestingly, the expression of Tim-3 is higher, while the cytotoxicy and IFN-ϒ production is reduced in patients with melanomas thicker than 1mm. Moreover, higher expression of Tim-3 and KIRB1, and a lower cytotoxic ability and T-bet expression is associated with local or distant metastases. Higher expression of MICA in the plasma was associated with worse prognosis, as was validated in an independent cohort (Figure 1). These data demonstrate that NK cells become progressively exhausted in the context of melanoma progression and that Tim-3 blockade possibly earlier in disease may have some benefit on innate immune function. 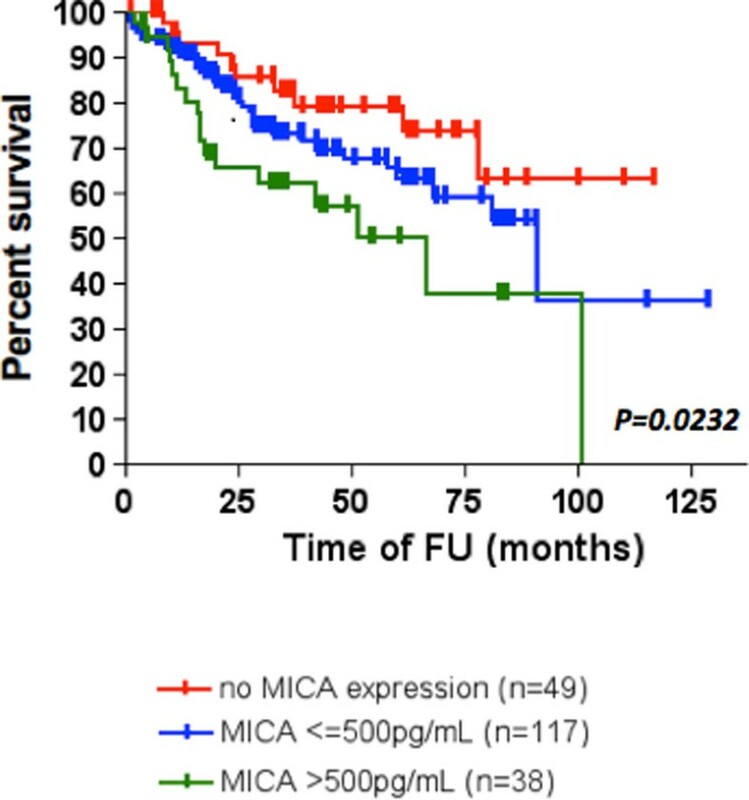 Finally, our data suggest that soluble MICA is a potential prognostic marker which may contribute to the NK cell exhaustion through its interactions with NKG2D.